Cal here for Tuesday Stretch. The last time I wrote I was setting up stretch glass at the Eastern National Antique Show in Carlisle, PA. The Stretch Glass Society had a booth there (along with a number of clubs) featuring an assortment of green stretch glass to promote our upcoming SGS Convention on July 24-26, 2017, in Marietta, OH. We generated quite a bit of interest by those going into and out of the show (all the clubs are in the entrance area to the Expo center) and spent quite a bit of time explaining that stretch glass was made in lots of colors other than green. It is generally good to attract attention and that we did! On Sunday, Brian wrote about his convention experiences and asked us to share our best convention memories. 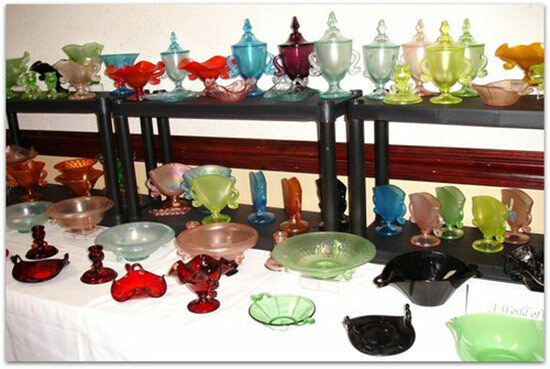 I have many great convention memories, most of them of conventions of The Stretch Glass Society, but also some from the Mid-Atlantic Carnival Glass Convention, the ICGA and most recently the Tampa Bay Carnival Glass Club Convention. I find collectors are generally the nicest folks to be around; most are willing to share their knowledge, answer questions and take a genuine interest in other collectors. At The Stretch Glass Society conventions we routinely receive compliments about how friendly we are and how much the visitors and first time attendees enjoy being at the convention. I thought I would share some photos of some of our past conventions with you tonight. Each year we select a theme and we assemble a “Club Display” focused on that theme. The Club Display is the centerpiece of our Convention meeting room and stays in place for the entire convention. We always have one or two of our experts talk about the stretch glass in the Club Display so it turns out to be a real educational experience for everyone at the convention. After the convention we share photos with our members who were not able to attend so they can experience it virtually through our newsletter and in recent years on our website. The Club Display can only be as magnificent as it is because it contains stretch glass from many members’ collections. As we all know, no one has all the rarities and oddities. But if everyone puts their rarities and oddities together in one display, it is really a breath-taking show. Let’s see what you think of these previous Club Displays. In 2002 the theme was Northwood Stretch Glass. 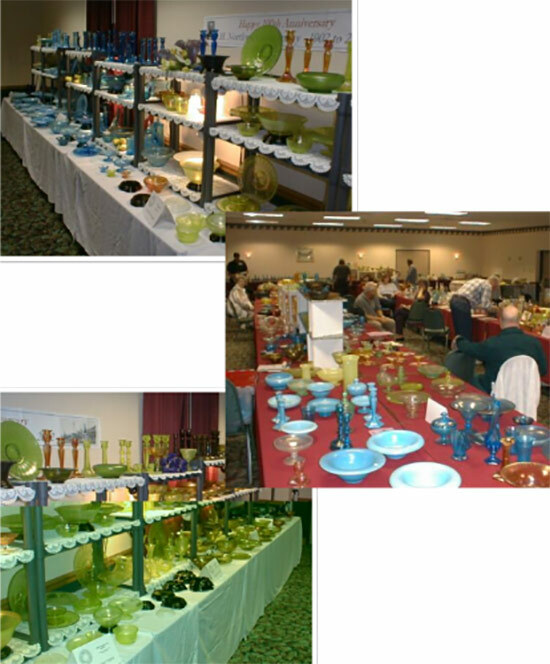 Dave and Renee Shetlar organized an outstanding display which featured nearly every known shape of Northwood stretch glass, often in multiple colors. As you can see from these photos, it was quite beautiful and highly educational. 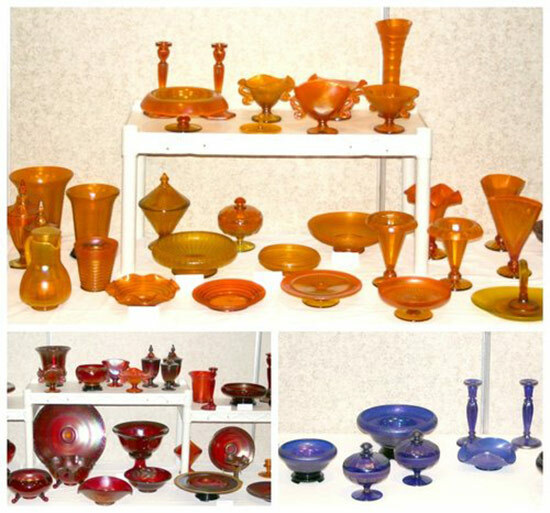 A couple years later, in 2004, the featured glass was “Fenton’s Vibrant Colors: Wisteria, Tangerine, Ruby and Cobalt. Again, the display was organized by Dave and Renee and it was spectacular. Many of you know Bill Crowl and may be aware that he had one of the premier collections of both Tangerine and Ruby stretch glass. As I recall, he loaned us pieces from both of these collections for our Club Display that year. I saw pieces of stretch glass that I didn’t even think existed! It was a sight to behold. In 2009 we took a look at “The World of Dolphins” and in a change of pace from past conventions, included examples of dolphin glass from as early as the 1840’s (Boston & Sandwich Glass Co) to the post depression dolphin handled pieces produced by The Fenton Art Glass Company. Of course there were lots of examples of dolphin-handled stretch glass which gave everyone in attendance much to admire and to look forward to finding in the future. In 2013 we collected an array of stretch glass with patterns. As I recall, we had about 150+ items in the display and exhibited stretch glass in over 30 different patterns. These were, of course, patterns that you are quite familiar with such as Chesterfield, Melon Rib, Adam’s Rib, Floral & Optic, Concentric Ring, Smooth Panel, Wide Panel, Narrow Panel, Basket weave and many more. And then there were patterns which you may not be as familiar with such as US Glass #310 and #317 and others. 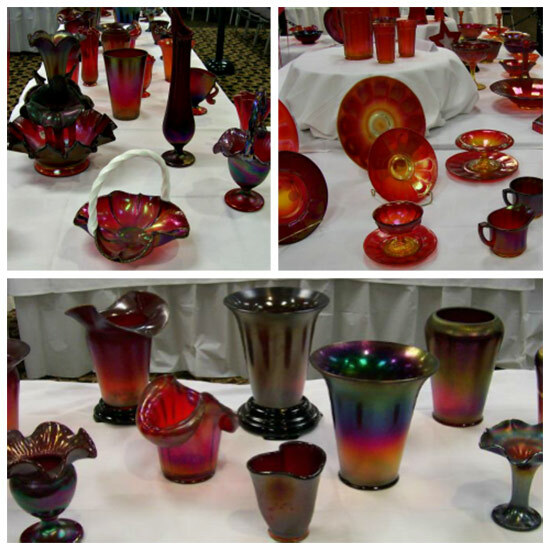 In 2014, The Stretch Glass Society celebrated our 40th anniversary with a stunning display of Ruby and red stretch glass including many rare examples. Take a look at these photos and imagine being there in person to see all of this glass in one room before your very eyes. 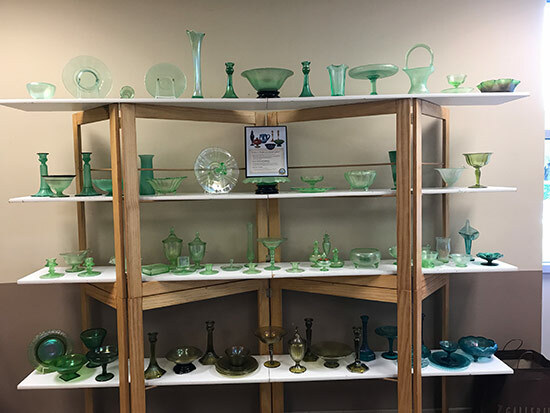 In 2017, our theme is “Giving Stretch Glass the Green Light” and our display will be examples of all the various green glass which became stretch glass over the years, both during the early period of production (1916-1933) and the later period (1970-2011). 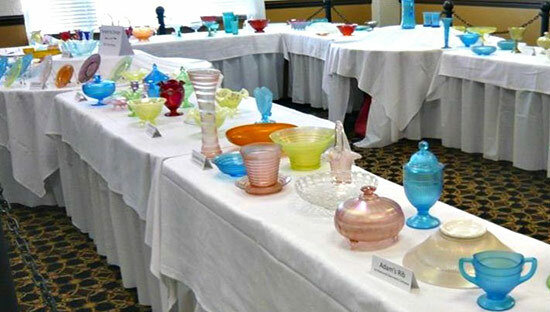 The examples that were on display at the Eastern National Antique Show (shown above) were just the tip of the iceberg! It will be a sight to see and we hope some of you will stop by our convention, even if it is just to see the stretch glass displays or participate in the Tom Burns’ Auction on Friday night. We will be at the Comfort Inn in Marietta, OH from July 24th through the 26th. There will be seminars, speakers, glass ID and more and all of your Tuesday Stretch contributors – Russell & Kitty Umbraco, Dave & Renee Shetlar and myself. 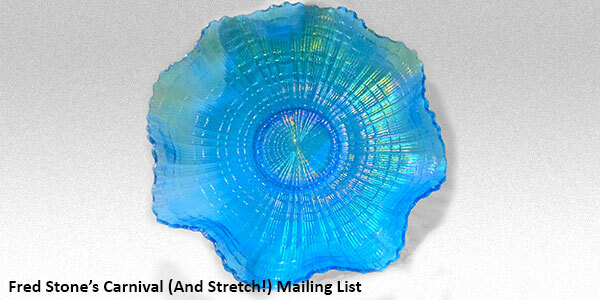 Convention information is on www.stretchglasssociety.org. Come join us and have a fun, learning experience!